.The Missouri Pacific #2 Site (11-S-46). Urbana: University of Illinois Press, 1983. xi, 255pp, 4to, with 67 figures (drawings, diagrams, maps [1 large folding feature map in pocket at rear]), 7 photographic plates, and 61 tables, in original illustrated and printed wrappers. 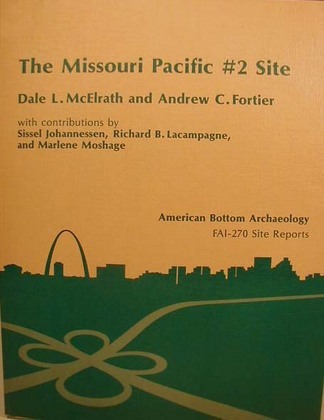 (American Bottom Archaeology FAI-270 Reports). New Overall a bright, tight and clean copy inside and out.